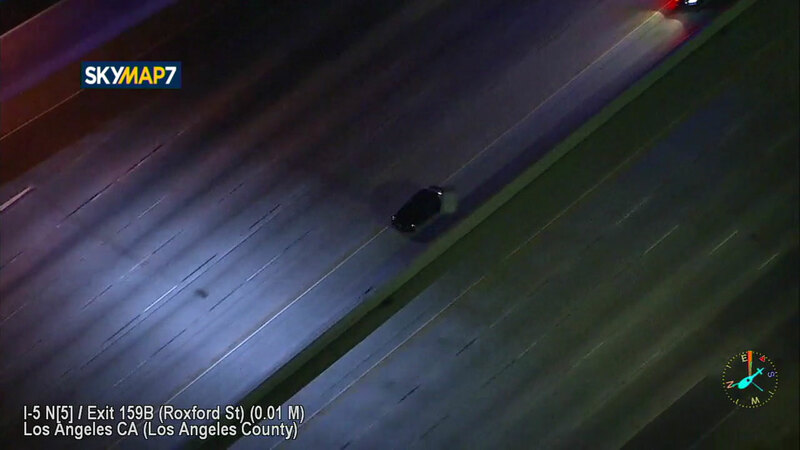 LOS ANGELES -- Authorities chase a reckless driving suspect through various freeways in East Los Angeles and into the Santa Clarita Valley Wednesday night. The chase started around 10:30 p.m. on the westbound 10 Freeway in Baldwin Park. Authorities said the suspect was wanted for reaching speeds as high as 110 mph in the carpool lane. Authorities also believe there may be more than one person in what appears to be a dark-colored Mercedes. The suspect traveled onto the northbound 5 Freeway, reaching high speeds and weaving through light traffic. At some points, the driver turned off their headlights and drove in the dark on the freeway. Other times, the driver flashed their headlights at other drivers in an attempt to move them out of their path. DEVELOPING: We will add more details to this report as soon as it becomes available.